The Boston Celtics used a complete team effort to dismantle the Charlotte Hornets 126-94 on Wednesday night. The C's used 34 assists and had six players in double figures to keep Charlotte at bay and walk away with a workman-like effort. Another game, another night without Kyrie Irving. For the second straight game the star point guard sat out while nursing a left hip strain. Terry Rozier, per usual, stepped into the starting lineup. To stop Charlotte, you really only need to limit Kemba Walker. The first-time All-Star starter has been fantastic this season, even if he has slowed down over the past couple of weeks. Walker scored or assisted on seven of the team's first 14 points. On the other side of the coin, Jayson Tatum was in his bag to open the game. He started 4-5 from the field and accounted for 11 points in the first eight minutes of the game. It was nice to see Tatum bounce back early against the Hornets after scoring just six points on 3-9 shooting on Monday night against the Nets. As Tatum dominated, the bench came in and continued to push the pace and take quality shots. Jaylen Brown and Gordon Hayward combined for nine points on 4-4 shooting in the first quarter. Brown has been ballin' as of late, but it was especially nice to see Hayward get off to a hot start. His four first quarter points matched his total (4) from the past two games. Boston's offense was humming in the opening frame. The C's shot 63 percent from the field and had a huge number of assists, which is always a great indicator that they are moving the ball and playing with pace. The Celtics had an obscene 12 assists during the first quarter. They’re 15 for 24 from the field (62.5 percent). Brown stayed hot to start the second quarter. Six points in the first four minutes helped Boston stem the tide of a Charlotte run by reserves Malik Monk and Miles Bridges. The Celtics extended their lead up to nine midway through the second quarter, but Charlotte ripped off an 11-0 run in under two minute to cut the lead down to four. Walker and Co. really stepped up their defensive intensity and grittiness during the run. They were the faster team to the ball and made a number of hustle plays that led to easy baskets. A few late buckets from Rozier and Al Horford halted the Hornets' run, and the Celtics took a 63-59 lead into the halftime break. The Celtics started the second half by extending their lead back up to nine. After doing some pretty big damage in the paint in the first half (36 points in the paint, their most in a half this season), Tatum, Rozier, and Marcus Morris all hit threes in the first few minutes of the third. With the Celtics surging, Walker continued to get frustrated with Boston's physical defense. He had 18 points midway through the third quarter, but his inability to get calls was clearly weighing on him. A 9-0 Boston run opened the lead up to 15 with just under three minutes to play in the third quarter. 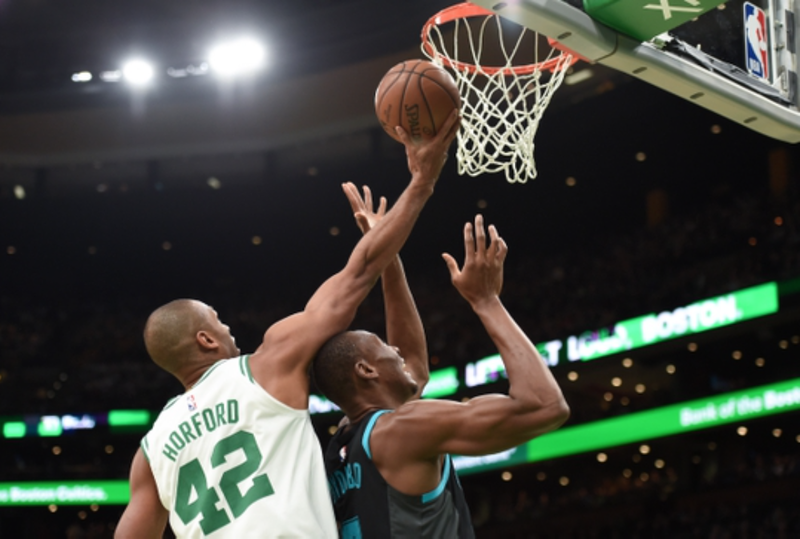 Horford feasted on the smaller front line of Charlotte, and was on his was to another stat-stuffing night. In the absence of Kyrie, which has been the case throughout the season, the depth of the Celtics really presented itself. It was a stark contrast between the one-man show of Walker and the balanced attack of the C's. Good balance again for the Celtics. Five guys in double figures in scoring midway through the third. With Walker on the bench, Brown, Rozier, and Tatum helped the Celtics pull away. The ball was popping, players were having fun, and there were plenty of highlights along the way. Rozier, Tatum, and Brown combined for 58 points through three quarters, and pulled off one of the better alley-oops of the season. Every player that entered the game was active on the defensive end and bought in to ball movement on offense. Besides a Walker-led run in the second quarter, Boston didn't have any lapses in effort, which have become far to common as this season has gone on. When they sensed Charlotte was fading, they ramped up the effort and put the game away. With the game fully in hand and garbage time in full effect, it was nice to see Hayward get some extended time in a non-pressure situation. It's no secret that he hasn't been close to the player he was before the injury, but the glimpses that we have seen of him playing at an effective level have always coincided with wins. Hayward finished the game with just 12 points, but he was much more aggressive and assertive with his movements. He looked much more secure and confident in what he was doing. The Celtics are an elite team when Hayward is a positive player, and in order to get where they want to go this season, they are going to need him. The Celtics will get back to game action on Friday night when they visit Madison Square Garden to take on the bottom-feeding New York Knicks.